The First Christmas Candle Of 2015! With 100 days to go we are very excited to be getting in a whole host of gorgeous smelling Winter and Christmas Candles, great for perking up those gloomy dark evenings! 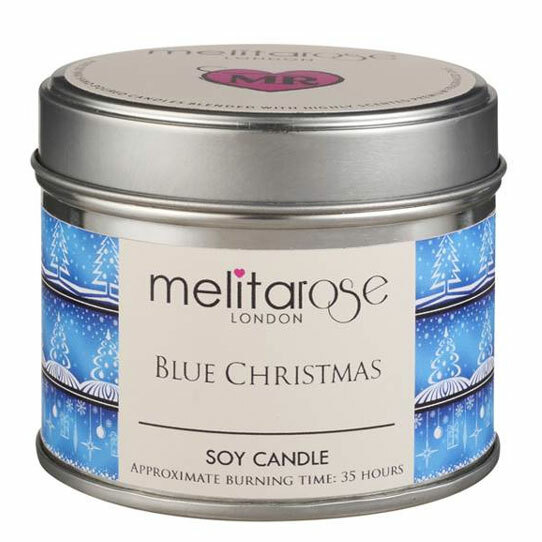 Buy the latest Melitarose Blue Christmas Candle, just arrived at Candles.co.uk. A rich cranberry accord dominated by sweet cranberry, blended with prune juice complimented by a fruity floral heart of summer strawberry, sun ripened raspberry and citrus orange, with sweet honey and rose notes. Wow! I just don’t know how they think up these amazing fragrance blends? New Candle Colour Couture Range By Shearer. Combining both Spring and Winter fragrances to create the most satisfying collection in home fragrance. With 100 hours of burn time in the tall pillar candles, this mix of luxurious scents in the Shearer Couture Range not only indulges in radiant colours but has an aroma to suit any room at any time. What we like about this range is that the fragrances are available all year round, so if you are more light and summery, the florals, fruity and fresh, you can choose your favourites any time any season. And if you tend towards the Winter scents, , spicy, herbal, cloves, cinnamon etc, no matter what time of year, you can indulge your rich aromatic passions. Up To 80% Off In Our End Of Summer Sale. Nearly time for all the Christmas stock to arrive so we have a whole bundle of goodies at great prices in our candle and diffuser sale. You seriously won’t find a better place to pick up a few early Christmas presents and pop them in the cupboard ready for December. Only 100 days to go……the countdown begins! Click here to see what’s in the sale.